Successfully Added MOYEAH APAP Ventilator 20A - Data Management, Automatic Pressure Adjustment, 3.5 Inch Display, Air Humidification (White) to your Shopping Cart. If you’re having difficulties breathing at night, the MOYEAH APAP Ventilator 20A is perfect for you. This health gadget is guaranteed to treat you to a good and comfortable night of sleep by providing a continuous stream of oxygen. Simply slip on the mask, and this health gadget will help you breathe in a healthy and natural manner throughout the night. The MOYEAH APAP Ventilator is especially helpful for people who suffer from sleeping apnea or for those of you who suffer from any other type of breathing difficulties. With this health gadget at your side, you’ll never experience difficulty breathing at night again. This health gadget comes with a 3.5-Inch display on which it allows you to constantly stay up to date on its readings. You’ll be able to easily select the right settings and keep track of your own or your patient’s breathing patterns. This smart health gadget lets you store years’ worth of data which makes it easy to analyze the breathing rhythms of a certain person over a longer period of time. Thanks to the fact that your screen automatically adjusts its brightness after dark, it won’t disturb you while you’re trying to get some sleep. Your APAP ventilator supports a range of different pressure modes for you to enjoy. 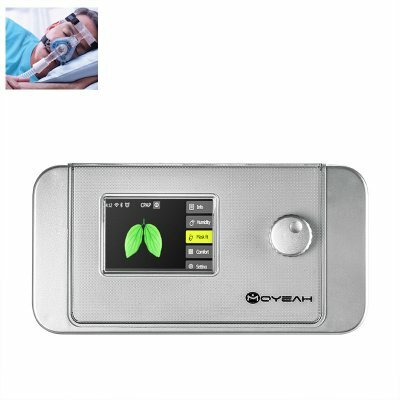 Its smart design makes it furthermore capable of automatically adjusting the air pressure based on the patient’s needs. Therefore, it is able to deliver an ultimate breathing support to any person out there. Additionally, your machine can be used on both CPAP and APAP modes. This means that you can be guaranteed it will meet your personal demands in breathing support. Simply slip on the mask and close your eyes to enjoy a comfortable night of sleep without ever experiencing any breathing problems again. The MOYEAH APAP Ventilator 20A comes with a 12 months warranty, brought to you by the leader in electronic devices as well as wholesale electronic gadgets..